ScoreStream’s internal algorithm allows fans to share game data and enjoy conversations with others around sporting events. Oien and other parents were finding it harder and harder to locate information on local and hometown sports teams. He also felt inadequate about using text messaging to share youth sports moments with friends and family. 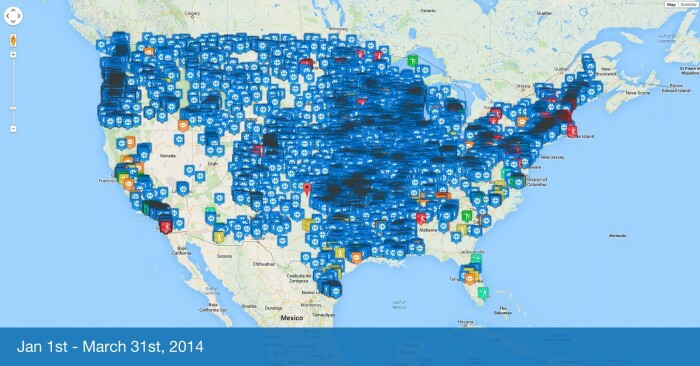 So ScoreStream was founded in April, 2012. •Scoring templates for each of the supported sports (Football, baseball, softball, basketball, soccer, volleyball and lacrosse). •Ability to share in game actions, scores and provide commentary. •Ability to share updates to others via Twitter, Facebook, SMS and the ScoreStream website. 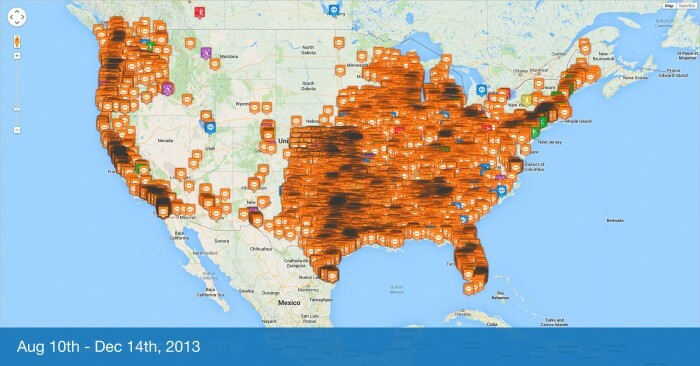 •Database of high school teams with mascot, team colors and location. •Ability to search for teams by name and location. •Ability to create your own teams with levels of play from professional to amateur. •Users earn points and badges for performing certain activities and gain ranking. The startup has been largely bootstrapped to this point but they are currently raising a round of financing in support of the fall sports season. They are seeking a $2 million, Series Seed round. Look for their updated angel list page on their website shortly. The money raised will be used to add more engineering, project management and marketing staff,. I asked him how much of the capital would be into new infrastructure. He explained how everything they use is state of the art, cutting edge IT so expect more of the same high-quality tech expenditures. In order to get ready for the jump in users this autumn, they put resources into upgrading the iPhone app to version 2.0. •Enhanced photo integration and use. Users can create custom scoreboard overlays. •Enhanced sharing. 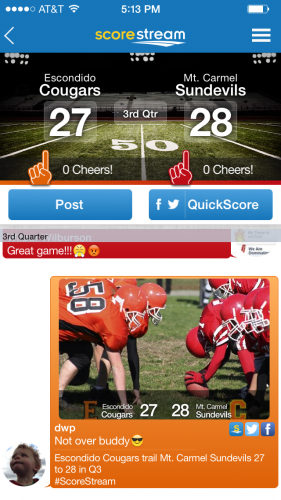 Non Scorekeepers can share games and photos via social media. •Enhanced notification capability. Subscribe to your local teams. He was excited to also let our readers know about upcoming announcements concerning a large number of partners in conjunction with fall football season across television, radio and newspaper properties that will include TV stations in Texas. 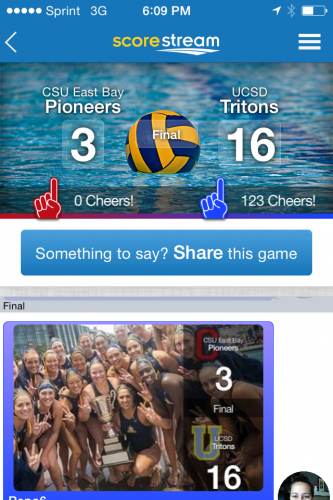 A local San Diego college women’s water polo team used their app to score and share games this last weekend as they advanced to the NCAA playoffs. You can review the UCSD win here. Users include: Triple Crown Sports, USSSA, AAU, Babe Ruth, Little League, Cal Ripken, Pony League, Dixie Baseball, Dizzy Dean, Connie Mack, NJB, YMCA, AYSO, FIFA, SCVA, USA Volleyball, Pop Warner, American Youth Football, USA Youth Soccer. Sports Techie, The goal is to have many authorized scorekeepers who generate data delivered in real time about high school and local scores across the country. These super users are ranked just like anyone else. The more accurate your input is, the better your ranking. They have improved their rating system of users by improving their algorithms. They now have a suite of tools to share scores. Now anyone can change the scores of games. Photos are front and center, you can overlay on scoreboards and every game is a potential chat room where anyone can go into a game and chat with fellow fans. Derrick assured me that as they scale up quickly, moderating chats will not an be issue, they plan to use moderating photo stops and keyword filtering software. They will also have ESPN SportsCenter type alerts that can be pushed out to digital device users. With 5 exits in the last 15 years between the executive management team that includes 3 former CEOs, I like this companies chances for success when most startups fail. Oien is a former student government nerd, a current serial entrepreneur and a knowledgeable business expert to chat with and learn from. John Smelzer worked with FIFA World Cup, the NFL, NBC Olympics, FOX Sports, News Corp. and Yahoo!., Smelzer was the lead attorney on the first NFL.com deal. The other three managers also have loads of tech experiences. Oien said the Pacific Northwest has been growing, especially Oregon, some in Washington, and every single game in Alaska. If you are interested in speaking to ScoreStream about investing, please contact me and I will make an introduction. Get ready for some high school football ScoreStream style by downloading their free iOS app, a new Android app will be forthcoming soon. Sports Techie will run a follow up story this fall so be sure to check back then.